Yoga Helped Me. Now I Help Others. Photo attributed to Flickr user dietmut. My mother and father became full vegetarians after learning of its health and non-violence benefits from the Gurus. They ate no meat, poultry, or fish by the time I was born, so I was also raised vegetarian and I have never tasted meat or fish in my life. This upbringing planted the seeds for a lifelong journey of teaching and practicing yoga. My introduction to Hatha Yoga (the yoga of postures) began when I saw my father doing shoulder stand in his meditation room as I grew up. But my own practice did not begin until I needed it, at the age of 17. In high school I developed chronic neck pain from working out in a gym and waiting tables. My chiropractor actually suggested yoga to treat my pain. I tried a 30-minute yoga video and by day two of doing the video, all of my neck pain was gone; no MRI needed, and I was hooked. The feeling of deep peace and relaxation I felt at the end was like nothing I had experienced before. I did that video daily throughout my senior year in high school and also as a freshman in college. The next thing I knew, I signed up for a Sivananda teacher training, living for a month at the yoga ashram in Canada. The experience was challenging and ‘different’ for a 20-year old, but it was life-changing too. It planted additional seeds for my lifelong practice and eventual teaching of yoga. I saw yoga as something that put you on a spiritual path, gave you discipline, and was a tool for wellness and balance of body and mind. I felt that I had to share this amazing gift with others. Soon after I returned to my college dorm, I started teaching yoga to my friends and conducting relaxation workshops for my dormmates. I watched with fascination to see how yoga helped others as it did me, and my passion for the practice grew deeper and deeper. Ever since, the learning and sharing continues. Stacie-Saraswati Dooreck is a Certified Gentle Integral Yoga Instructor, Certified Sivananda Hatha Yoga Instructor Since 1995, and a Certified Kundalini teacher, bringing a wealth of knowledge to her classes. Stacie used chair yoga while healing from an illness and continues to share with others the benefits of chair yoga. In 2011 she was featured on CBS Ch. 4 News Healthwatch teaching “Yoga for Seniors.” In addition, Stacie is a Certified Fall Prevention Trainer for seniors and trained as an Enhanced Fitness Instructor (evidence based chair exercises and fitness for seniors including cardio, strength training and stretching). 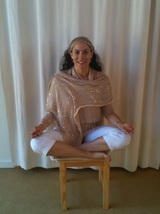 She created and leads SunLight Chair Yoga Teacher Trainings in the US and The Bahamas. Stacie is the author of the book SunLight Chair Yoga: Yoga is for everyone!, a book designed to to teach those with chronic illness, injuries, in wheelchairs or at a desk (Yoga at work) how to modify yoga so all can benefit. Stacie can be found on Facebook at facebook.com/sunlightyoga and on Twitter @sunlightyoga, @yogainchairs and @yogainsf. 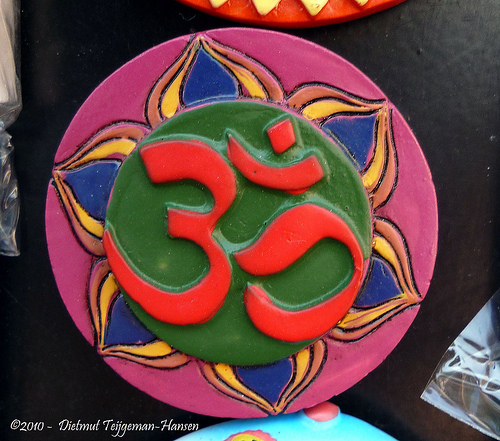 This entry was posted in Physical Healing, The Yoga of Life and tagged chair yoga, chronic pain, Hatha Yoga, health, injury, inspiration, meditation, Siddha Yoga, Sivananda, spirituality, Stacie-Saraswati Dooreck, The Yoga Diaries, yoga by The Yoga Diaries. Bookmark the permalink. Stacie, you are a beautiful soul. Thank you for sharing your gift and your heart. I have tremendous gratitude for the compassion of both Stacie and her father. The spirit and practice of yoga has flowed beautifully — like a waterfall of giving — from father to daughter, and so many of us have received the benefit of their generous caring. Om Om Om. Om shanti Vicki. Blessings as you enjoy your yoga and continue to share it with others. You are an inspiration! Mahalo!